Why Are Filing Storage Systems Still Important In the Information Age? Home→Filing Systems→Why Are Filing and Storage Systems Still Important In the Information Age? Why Are Filing and Storage Systems Still Important In the Information Age? As early as in the 1960s, when we realized we were heading into the Information Age, it was thought that office of the future was going to be one without paper and that filing and storage systems were to become simply a workplace relic of the past. By digitizing old documents and working electronically with new ones, this “paperless office” promised to replace one that was burdened with the need for physical storage and inefficiency of seeking and sharing information, as well as all of the associated costs in time and money. Today that promise has only been partially fulfilled, with paper-based record-keeping still having a large presence in the daily operations of many businesses and industries. A study commissioned by Adobe looked at just over 1,000 managers of businesses small to large, and they found that only 18% of the businesses were truly paperless. All the great advantages of going digital aside, that’s still 82% of businesses who potentially use filing and storage systems! Security is probably the number one concern in the eyes of businesses that still utilize hardcopy filing and storage systems. The healthcare industry is one that’s closely tied to keeping records via electronic health records (EHR), with medical facilities hiring medical records clerks who specialize in creating and retrieving patients’ medical records. As you may know, the Privacy Rule under the Health Insurance Portability and Accountability Act (HIPAA) puts the confidentiality of patient personal and medical information at an extremely high priority. Any healthcare worker is aware of how serious it is to maintain the privacy of an individual’s health information, which can be severely undermined through anonymous security hacks and other security breaches, even with cloud storage. Compared to digital record-keeping, lots of practices find physical filing and storage systems, to be more familiar and less burdensome from a technological standpoint. Particularly in small practices, managers would feel the strain of learning a new electronic filing system and also training staff to learn it as well, as they lose time in the day to properly attend to the needs of their own clients and customers. Also, due to a lot of software’s proprietary nature, sharing data and information across locations and departments, such as in the healthcare industry, is not always a smooth operation if not all practices have committed to using the same software needed to communicate with each other. Filing and storage systems are also attractive in rural areas, since it may be difficult to have access to proper IT support or high-speed broadband connectivity, which are essential for a properly-run digital filing system. With filing and storage systems, there isn’t a one-size-fits-all solution. There’s more than one way in which businesses can store their records, and several factors should be taken into account for selecting the most efficient system for your business. The most commonly known form is the vertical file cabinet, which features filing drawers that are stacked one on top of the other. The files themselves have their tabs or labels at the top, and they’re also accessed from the top of the file drawer. They are also great for when sorting files alphabetically. A lateral filing and storage system organizes its files horizontally rather than vertically, with tabs and labels that extend from the side edge of the file. They can be stored either in drawers or simply on open shelving. In either case, they are more space-efficient than vertical files: you can get more files into a lateral filing and storage system while using the same amount of space. High-density filing and storage systems are a highly advantageous option when your business has to manage a massive amount of information over a limited amount of space. Most high-density systems are associated with medical practices for this reason—for them, file management means representing a high volume of patients and doing so potentially throughout the course of their lives. High-density filing and storage systems address this problem while greatly reducing the storage space you’re paying rent on by maximizing a vertical component with floor-to-ceiling storage. To easily move from shelf to shelf quickly, a tracking system can help expand and minimize the system when needed. There are also locking mechanisms that help you to stay in compliance with HIPAA law in ensuring the security of sensitive patient information. Storage rooms for any office, healthcare or not, would also find high-density filing to be most useful. 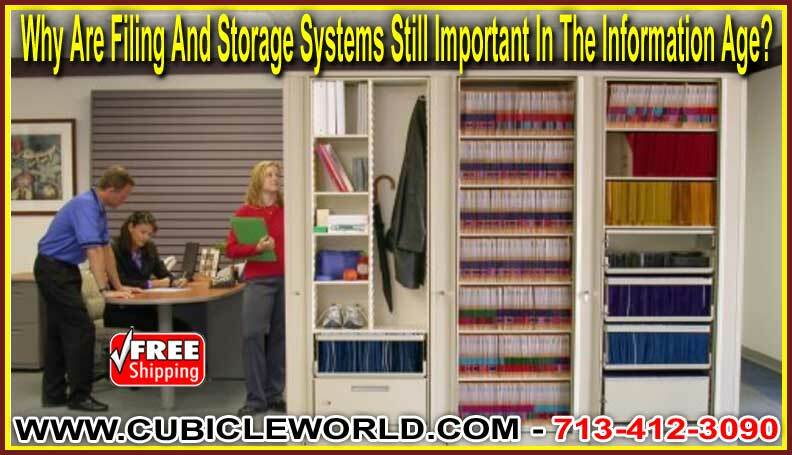 As long as you’re still needing filing and storage systems for your business, don’t hesitate to call us at Cubicle World. With almost three decades of experience in filing and storage configurations under our belt, we can help you find the right system that will work with your office needs.